Hi! I'm Melanie Pappas and I'm so glad you're here! I'm a floral designer and the owner/operator of M Floral Boutique here in Los Angeles. Although based in L.A., M Floral Boutique can travel and is capable of bringing beautiful florals to you no matter the location! If you're wondering about me, here are a few things... I graduated in 2012 from UNLV with a degree in Biology (cell and molecular). I've lived in California, Nevada, New York, and then moved back to California in 2013. I'm a trained dancer but look like a crazy person when I hit a wedding dance floor (it's more fun that way). I've been running M Floral Boutique from my home studio since 2015 and love every minute of it! Although I live in Los Angeles, my brain likes to think I live somewhere a bit more rural since I have a dog, cat, tortoise, 5 chickens (and 4 more chicks about to hatch soon!). Seriously though, my chickens are cute and I'll probably talk about them any chance you let me. My husband humors me with all the animals... he still loves me somehow. Guilty pleasures include Harry Potter, anything Disney, watching the Bachelor (I'm still not sure why I still watch it but what can you do? ), trivia game shows, traveling literally anywhere, and watching British reality shows. I'm so stoked you're on my page and thinking about letting me create your wedding or event flower arrangements! I know how much this day means to you and I want you to know how much I want it to be just as you envision it. 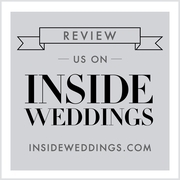 It's my job to help make your wedding planning process go a bit smoother- whether that be recommending other vendors, answering your emails about design notes, or just helping out with anything wedding related you might need. Think of me as your wedding day hype woman! If you would like to learn more about the general wedding booking process and a list of frequently asked questions, please visit here. Feel free to fill out the contact form or email me at mfloralboutique@gmail.com so we can get in touch! I'd love to hear from you! Custom and unique arrangements are available to be created for weddings, holidays, and events such as sweet sixteens, bridal showers, baby showers, and charity functions. Designs can also be created for restaurants or households. We pride ourselves on high quality arrangements for every occaision. Delivery can always be arranged at an extra fee. Call or e-mail for quotes and pricing.